Age Of Empires: Mythologies is easy to navigate, with "Multiplayer" being an option right on the main menu. The game's opening credits are skipable and the download time is short at around one (1) minute. The menu is very responsive and doesn't take lots of unintensional taps, but the options are extremely small and difficult to hit precisely. The game uses a nice mix of touch control and button options. Everything is available via touch control or everything is avaiable without touch control, but many players will find a mix to be the most comfortable. As for the touch controls, with the exception of dragging the menu around for a detailed look, pretty much eveything is tapping. You tap on the troop unit, building, enemy, or empty space and then tap options in pop-up menus. As with the out-of-game menu system, the menus could stand to be a little larger. The game's Single-Card Download feature is a nearly complete two player Vs Play strategy campaign. Not all aspects of the game are included: relics, culture choices (you can only play as Greek, with Herakles as the hero), some of the building types, etc., but there's a lot of content in the main game (which is not reviewed here) that would make including absolutely everything unfeasable. There's more than enough that IS included to cover more than ten minutes of play time. Despite how much is included, the same scenario is played each time. Graphically, the game is well set up and even some of the smaller troops look different enough to tell them apart. Likely due to size restrictions, the main game's animations are no included in Single-Card Download Play. The game features some nice "mood music" that helps to set the game's tone, but isn't essential to the game (if you're paying attention). Turn-Based Strategy video games can be great fun when done right. As opposed to Real-Time Strategy titles, turn-based games allow you to stop and think, decide on your actions, and then watch the result of your actions while your opponent(s) take their turn(s). One way of thinking of a trun-based strategy game is to think of it as a "Choose Your Own Adventure" book. A good Turn-Based Strategy game will challenge your ways of thinking and - possibly - teach you some new ones. While the quality of most turn-based strategyt video games is judged significantly by the game's AI (artificial intelligence; it's ability to try to beat you in an intelligent manner), this site reviews only Single-Card Download multiplayer, so there's no AI involved here. That being said, how does the game stack up? Age Of Empires: Mythologies is a blast! I played it repeatedly in Single-Card Download (more than I needed to put together this review, for sure). I built everything available in the Single-Card Download version of the game, which admittedly isn't everything. The controls are responsive, the setup takes great advantage of the Nintendo DS's hardware, and the controls are friendly and natural. Truth be told, it's been a while since I last played a Turn-Based Strategy game (there really aren't that many for the DS and only two have Single-Card Download) and this game makes me want to get back to playing them more often. Seeing games as good as this one makes me wonder why more publishers haven't added Single-Card Download multiplayer to other Turn-Based Strategy games (because it's turn-based, not as much processing power is required compated to Real-Time Strategy games. Griptonite did a commendable job with this Microsoft property and I'm definitely looking forward to more games in the series! Increase the sze of the menu options, both in the out-of-game menu system and in the in-game pop-up menu systems. Offer different map sizes (small, medium, large) for the Single-Card Downloadable game. Make the tutorials (or a single, summary tutorial) available as a downloadable, interactive demo. Allow for up to four (4) players to participate in the Single-Card Download Vs Play. 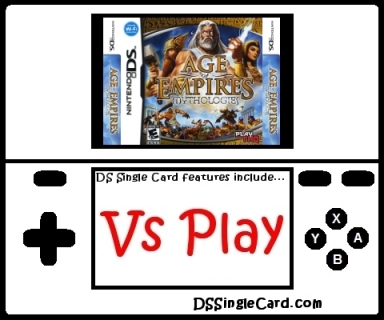 Click here to return to the DSSingleCard.com Age Of Empires: Mythologies profile.